Preheat broiler/oven to medium-high (450 degrees F). Line a baking sheet with aluminum foil and coat with nonstick cooking spray. Rinse any ice glaze from frozen Alaska Halibut under cold water; pat dry with paper towel. Place halibut in pan and broil about 5 inches from heat source for 4 to 6 minutes, or until lightly browned. Turn fillets over and season with salt and pepper. Broil an additional 5 to 7 minutes for frozen halibut OR 1 to 2 minutes for fresh/thawed fish. Cook just until fish is opaque throughout. 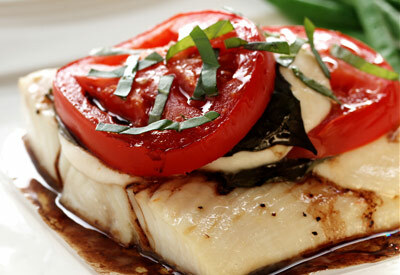 Remove halibut from oven and layer 2 slices cheese, then 2 basil leaves, and 2 slices tomato over each portion. Return halibut to the oven and broil an additional 2 minutes, until cheese begins to melt. Blend balsamic vinegar and oil. To serve, spoon dressing over fillets and garnish with chopped basil.